Poovar is now steadily growing as a popular Kerala holiday destination. The reason for this can be estimated to lush greenery and sandy isolated islands that set up for a romantic time. Hotels in Poovar are amazing places to stay when visiting the city. The romantic environment that is placed all around these resorts ensures that those who decide to stay can make the best of their Poovar vacations in Kerala. Surrounded by islands, green swaying coconut and palm trees and Majestic water bodies, the time spent here is peaceful and full of quietude. The food cooked in these hotels is also very delicious and those who have it get an authentic taste of Kerala cuisines. Mainly there are island resorts in Poovar, which feel like staying in your own private island. 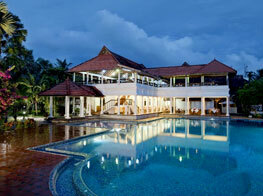 Maintaining the natural ecosystem of the island destination in Kerala is given primary importance in these resorts. Those who stay in here are guaranteed to have an unmemorable time in Kerala. Poovar resorts and hotels maintain the reputation of Kerala as “God’s Own Country”. Try staying in the hotels given below and experience the magic happening.